Powerfield's corral in a bag! This creates a 50' square area with 200' of Powerfields 1" polytape on a lockable rewind reel. 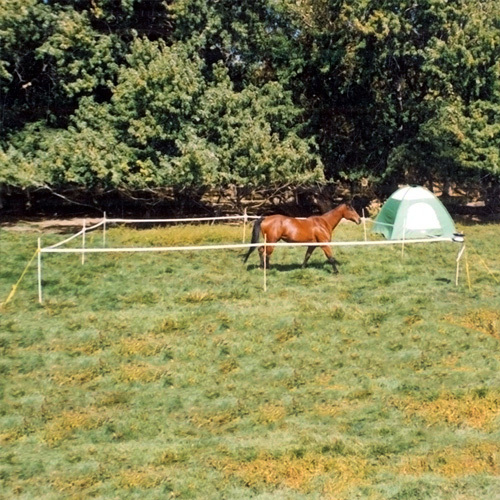 The webbing is secured on eight 2-piece treaded posts and powered by The Trail 2 D-Cell Fence Charger. 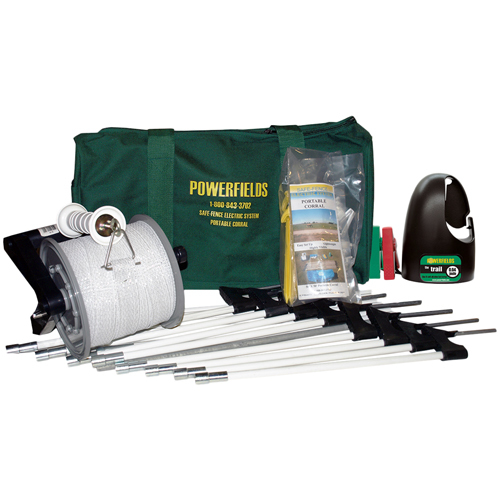 The kit also contains four corner tie-downs, adjustable insulators, a ground rod, and installation instructions. • Comes in a rugged 24" carry bag that is easy to pack. Estimated Delivery Time: This kit can take 2-4 weeks for delivery. - This came in handy for horse shows!!! Shipping: This item ships UPS. Delivery time can range from 2-4 weeks.